Yesterday, I highlighted some recent studies about the heart healthy effects of magnesium. Today I want to give you a sense of just how broad a range of conditions magnesium can impact. COPD (chronic obstructive pulmonary disease) is a progressive lung disease that makes it difficult to breathe. According to the National Institutes of Health, more than 12 million Americans are currently diagnosed with COPD. And it’s estimated that at least as many people have COPD, but haven’t been properly diagnosed. A study published in October of 2008 may offer some hope to those that suffer from this condition. 21 men with COPD participated in the study. The average age was 64. Half of this group received magnesium in an intravenous (IV) form. The other half received a placebo IV. The men receiving the magnesium experienced a “reduction of lung hyperinflation and improvement of respiratory muscle strength”. Lung hyperinflation makes breathing less efficient. Greater respiratory muscle strength allows for improved breathing capacity. Both of these changes provide a marked benefit for COPD sufferers. Another very common respiratory condition is asthma. Asthma is a chronic condition that involves the inflammation and constriction of the airways. This makes breathing a difficult task indeed. In December of 2008, a new study examined the potential of a magnesium IV to help manage symptoms in a group of asthmatics. The magnesium IV was used in a group of patients suffering from an acute asthma attack. The ages of these patients ranged from 18-60 years of age. All of the patients were admitted to a hospital and given the standard medications to control their asthma attack. But some of the patients were also given a magnesium IV in addition to their medications. The group of asthma sufferers that was given the magnesium IVs showed a greater improvement in breathing ability and also exhibited a quicker recovery rate. The latter point was evident in faster (hospital) discharge rates. The authors of the study suggest that magnesium IVs should be considered as an adjunct to standard medical treatment. Magnesium isn’t only for your body. It’s also important for our mental health. The following studies offer a glimpse into the value of this mineral in keeping our minds healthy. In January of 2009, a study out of Australia examined the role that dietary magnesium may or may not play in the incidence of anxiety and depression. In order to answer this question, researchers studied a group of over 5,700 men and women. The men and women were asked to fill out detailed food questionnaires and were required to take a special test that quantified their levels of anxiety and depression. Regardless of age or gender, those participants who consumed the most magnesium suffered from the lowest risk of depression. There was also a smaller association found between magnesium intake and anxiety. But in this case, it was not considered to be “statistically significant”. Have you ever heard of Tourette syndrome (TS)? Tourette syndrome is a nervous system (neurological) disorder in which patients speak or move in involuntary ways. These involuntary actions are often called “tics”. An example of a tic might be the jerking of the neck or the inappropriate shrugging of the shoulders. The same pattern plays itself out in the involuntary vocal tics. As you can imagine, this is a very distressing condition for both TS patients and those who live and work with them. The really heartbreaking thing about TS is that it typically begins in early childhood. But hope can be found in a recent trial that was conducted on children with Tourette syndrome. In this case all the children were given a daily dose of magnesium and vitamin B6, for a total of 90 days. The researchers then used a test called the Yale Global Tics Severity Scale to determine any positive or negative effect of these nutrients. They found that the “total tic score” was dramatically lower in the children receiving the nutrient combination. At the start of the trial, the children’s total tic score was about 27. At the end of the 90 days, it had dropped to about 13. The conclusion of the study stated that, “The treatment assayed is safe and effective in reducing the harmful effects of TS in children”. Now, I can understand if you’re wondering why I chose to include a relatively rare disorder such as Tourette syndrome. The reason is to illustrate the incredible potential of magnesium – even in conditions that are rather obscure and that might seem beyond the scope of nutritional therapy. The truth of the matter is that I had too many studies to work with. For instance, I could have told you that consuming higher levels of magnesium can help lower your risk of developing gallstones by nearly 30%. 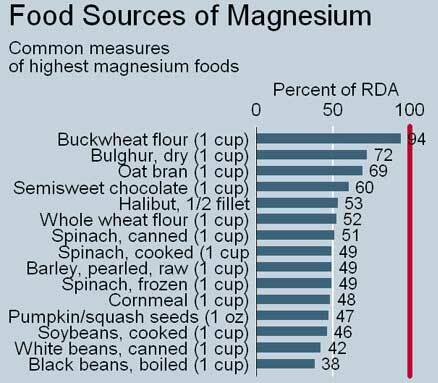 Or I could have discussed magnesium’s role in managing migraine headaches. And I could go on and on. That’s how versatile and important this mineral is. So please take a look at your diet. Think about the areas of your health care that you want to address and then ask yourself this: Am I getting enough magnesium in my diet and supplements? I think it’s definitely something worth considering. J Headache Pain. 2015 Dec;16(1):516. BACKGROUND: Non-medical, non-pharmacological and pharmacological treatments are recommended for the prevention of migraine. The purpose of this randomized double-blind placebo controlled, multicenter trial was to evaluate the efficacy of a proprietary nutritional supplement containing a fixed combination of magnesium, riboflavin and Q10 as prophylactic treatment for migraine. METHODS: 130 adult migraineurs (age 18 – 65 years) with ≥ three migraine attacks per month were randomized into two treatment groups: dietary supplementation or placebo in a double-blind fashion. The treatment period was 3 months following a 4 week baseline period without prophylactic treatment. Patients were assessed before randomization and at the end of the 3-month-treatment-phase for days with migraine, migraine pain, burden of disease (HIT-6) and subjective evaluation of efficacy. RESULTS: Migraine days per month declined from 6.2 days during the baseline period to 4.4 days at the end of the treatment with the supplement and from 6.2.days to 5.2 days in the placebo group (p = 0.23 compared to placebo). The intensity of migraine pain was significantly reduced in the supplement group compared to placebo (p = 0.03). The sum score of the HIT-6 questionnaire was reduced by 4.8 points from 61.9 to 57.1 compared to 2 points in the placebo-group (p = 0.01). The evaluation of efficacy by the patient was better in the supplementation group compared to placebo (p = 0.01). CONCLUSIONS: Treatment with a proprietary supplement containing magnesium, riboflavin and Q10 (Migravent® in Germany, Dolovent® in USA) had an impact on migraine frequency which showed a trend towards statistical significance. Migraine symptoms and burden of disease, however, were statistically significantly reduced compared to placebo in patients with migraine attacks.